Emergency workers respond to a pedestrian hit by a car on Broadway. Miles Eggleston for the Journal. 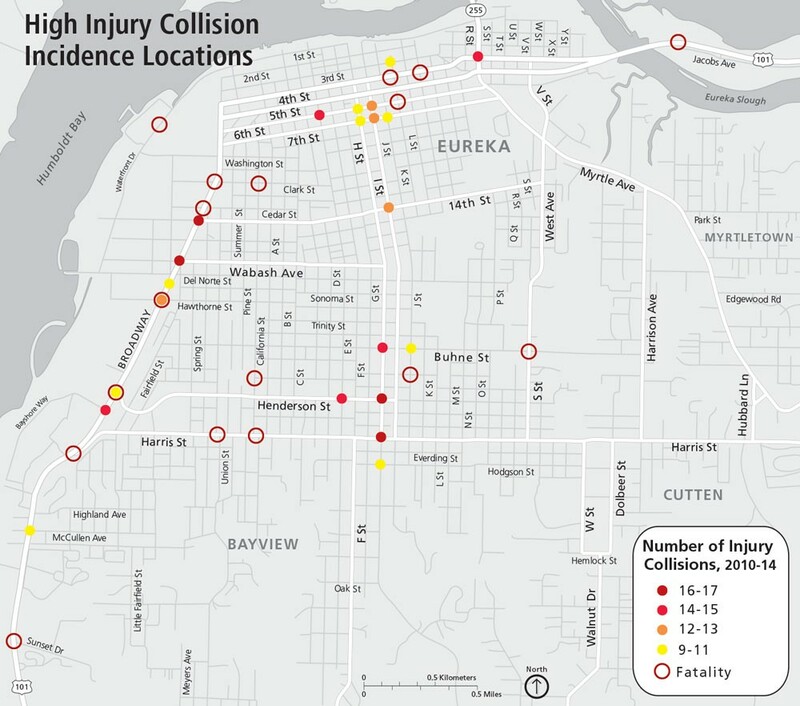 Data collected by the city of Eureka shows dangerous intersections along the city’s thoroughfares. Following a terrible year for countywide traffic deaths, Eureka is continuing its push to make its streets safer. In August, the city produced a transportation safety action plan, a collection of data, goals and priorities to lower the number of collisions in city limits. To do that, the city needed to look at car crashes. In the five years between Jan. 1, 2010 and Dec. 31, 2014, the city recorded 4,010 crashes, about 800 a year. Sixty-eight percent of those caused property damage only, but more than 1,200 caused injuries. Seventeen were fatal. While city data shows a downward trend in all types of collisions except fatal ones since 2012, they remain a costly problem for the community. Using national figures, the city estimates that the five years' worth of traffic accidents in Eureka cost more than $150 million. That, of course, doesn't take into account the emotional (and associated economic) costs of losing loved ones or living in a community with a high rate of car crashes. Looking to further explore the problem, the city developed a map of the "high incidence locations," intersections where the most injury crashes have occurred in the last five years. The map paints a stark picture, highlighting a large number of tragic accidents along some of the city's most traveled corridors: Broadway, Fourth and Fifth streets, as well as H, I and J streets. That's partly to be expected; the most trafficked streets are where accidents are going to be more concentrated. But it also raises questions: Why are these crashes happening, and what can the city do to prevent them? Maps and data in hand, staff is now setting out to answer those questions, but they face plenty of challenges. Police Chief Andy Mills said the city's taking a three-pronged approach. Identifying the cause of crashes, and the actions that will best prevent future crashes, is hard to do. The "primary collision factors" in the city's report are automobile right-of-way violations, sign and signal violations and driving at unsafe speeds — categories that seem to cover a wide variety of vehicular misbehavior. And at any given intersection, the root of that misbehavior might be different. If someone turns left at a red light, that could be a lack of education; if he or she runs through the stoplight, that might be an enforcement issue; if the stoplight is hard to see because of its angle or tree branches, a change in infrastructure might be necessary. First is education. Getting people to slow down, obey laws and stay off their cell phones is paramount to public safety, and Mills said the city has a number of ongoing efforts to educate people, from handing them informational pamphlets during traffic stops to hands-on high school programs and social media campaigns. "It takes all of these mediums to make sure people are informed," Mills said. But the results of education programs are somewhat intangible. Mills said he couldn't tell if the city's "Heads Up" campaign — fliers, ads and posters distributed around town asking pedestrians and drivers to be careful of one another — had any effect on overall safety. Last year's summer months saw a 35-percent reduction in injury collisions, according to a report in the city's December newsletter — good news, no doubt — but Mills was quick to point out that it was a snapshot and not necessarily indicative of a trend. Second comes enforcement. That's an area where the city is currently struggling a bit. Mills said he's down to one traffic officer, with one having left recently and another officer undergoing unrelated training. From 2010 through 2014, the department had three dedicated traffic officers per year (four in 2013), and gave out thousands of citations for cell phone, speeding, DUI and other violations. With the city's new maps, Mills said, he may be able to tell beat officers to focus on traffic violations at problem intersections. And, he said, the city may turn to enforcement tools like red light cameras that automatically cite violators. Those can be costly to implement, he said, but can pay for themselves and allow enforcement without boots on the ground. Red light cameras hint at the city's third strategy: infrastructure. 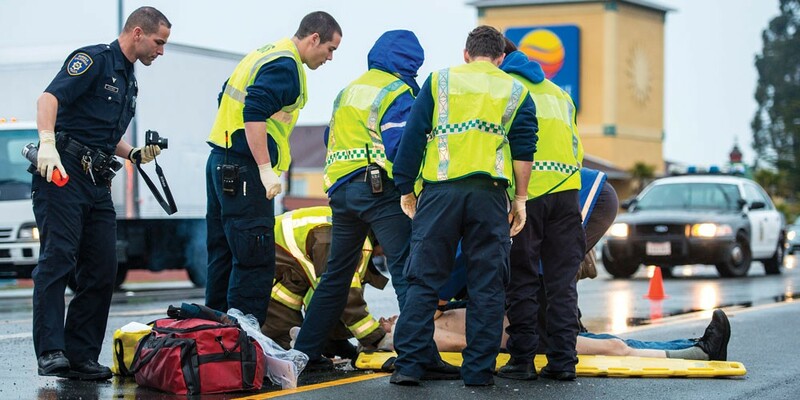 With high-incident intersections identified, the city's next step is to visit them and identify problems with road layout, visibility, signage, signal timing and other safety issues. Mills said they'll prioritize intersections with the highest number of injuries and fatal collisions. In the transportation safety action plan, there's a vast list of street improvement projects the city has completed in the last five years. Currently, only four "future projects" are included in the plan; presumably, with the city's newly compiled data, that list will grow. But, Mills said things are in a bit of a holding pattern, with his limited traffic staff and the city's traffic project manager, Sheila Parrott, slated to leave the job soon. In an email, Parrott said the city's currently working on a timing upgrade for all of its signals — but that doesn't include signals on the U.S. Highway 101 corridor through Eureka, which belong to Caltrans. The state agency's local chief of traffic safety, David Morgan, said his agency has been focusing on the intersections where State Route 255 crosses Fourth and Fifth streets on the north side of Eureka. Caltrans has changed signals there and plans to improve southbound traffic flow by adding a third lane from V to R streets. The agency is also hoping to close the Fairfield Street "fifth leg" at the intersection of Broadway and Wabash. Morgan said the proposal has been presented to the city and that he expects it will be approved. Most of Eureka's traffic collisions — at least from Caltrans' perspective — are congestion-related. "Eureka is a thoroughfare for so much traffic," Morgan said. "We do have congestion. It's something we're always thinking about."